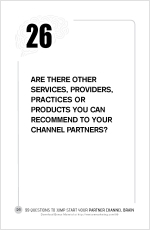 Are there other services, providers, practices or products you can recommend to your Channel Partners? Are you a “new thing” miser? When you discover a new way to solve a nagging problem or a cool, new vendor, is your first reaction to share it with your Channel Partners, or do you hoard it? Today’s question is actually not about the existence of services and products you could share with your Channel Partners. Rather, it’s really about what you share. And of course, by your answer you’ve just told me everything I need to know about the value you place on your Channel Partner relationships. Have you ever dated someone who exists to talk only about themselves. The kind of person who sincerely hums the words to the parody song, It’s all about Me, Jesus? When it’s all about Me! At what point do you share ideas, services, practices with your Channel Partners that aren’t related to your business or getting the next order? For instance, what would happen if your Channel support team created a list of 12 things you could share with your Channel Partners that would help them accomplish more in their day, be a more effective PowerPoint presenter or improve their email subject-lines? Then you could turn these into monthly brown bag lunch/lunch ‘n’ learn webinar topics where you could invite all your Channel Partners to attend. How to recognize a co-worker with an atta boy and avoid looking like you’re sucking up. 10 ways to get people to open your emails with more effective subject lines. Guy Kawasaki’s proven formula for instantly improving your PowerPoints. Simplifying life at work and life at home. 4 proven techniques we follow to stay healthy. How to write proposals in 3 easier steps. Sales contests where everyone can win—and—how to run a contest on a beer budget and still get results. I’m sure you can come up with a ton more—and yours will be even more appropriate for your Partners. The important thing is to shift the conversation from it being about you and your product line to them.